25 Jun Summer Color is Here! Welcome to the first week of summer. What a lovely time of the year. The gardens are bursting with color. Hummingbirds visit the pots around my deck every day. Bees and pollinators abound in our organically tended landscapes. We are eating from the gardens more and more, especially greens and fresh herbs. We continue to plant every single day- annuals, perennials, vegetables, fruits, flowering shrubs… As long as the plants are in containers, they can be easily slipped into the ground without any shock. My staff has gotten in some new veggie plants including ‘Sungold’ tomatoes and a few other select varieties. We have gorgeous zinnias, snapdragons, and pretty annuals to supplement your cutting garden. It really is a pretty week here at the garden center. 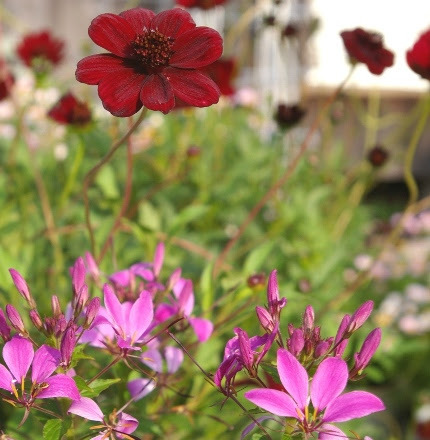 Fresh summer color: chocolate cosmos and spider flowers (Cleome). 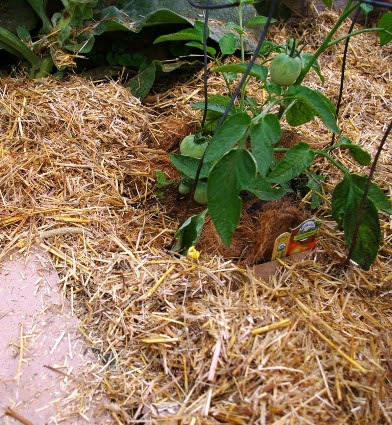 Weed Barrier paper below straw mulch is a great way to hold in moisture and control weeds. 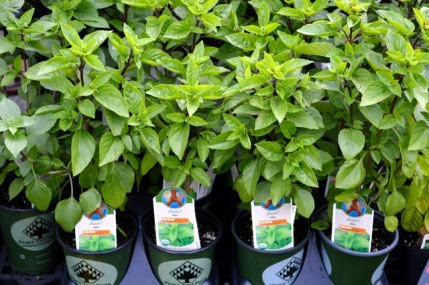 ‘Ajaka’ basil has a good, strong flavor and is disease resistant. tomatoes. I saw a bit of early blight on some of the bottom leaves, probably due to the many rainy days we’ve had. I cleaned them off with rubber gloves, discarded the diseased leaves in the garbage, and sprayed the plants with BioSafe Disease Control to prevent its spread. Santitation and open pruning are so important at this time of year. We are stocking a very disease resistant and very tasty basil named ‘Ajaka’. Last year downy mildew on basil was rampant. This year, so far so good, but we sought out disease resistant varieties to offer in case the weather got really humid and wet and the disease cycle begins again. The blueberries are starting to ripen and my ‘Autumn Britten’ raspberries are too. They are at least a week ahead of my other raspberry varieties. 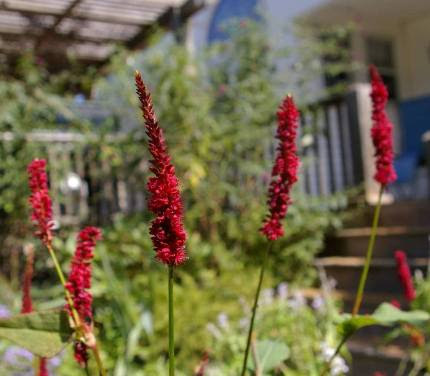 Persicaria ‘Blackfield’ is one of the stars of my summer and fall garden. We have it on our benches for the first time in many years. 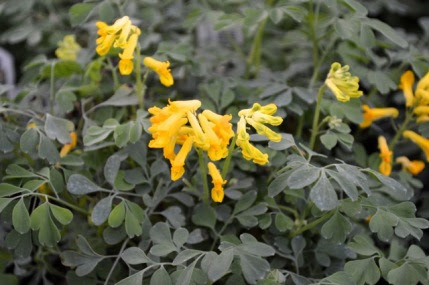 Corydalis lutea blooms for months and months. also a super long bloomer. It is flowering in our demonstration gardens now and will continue to do so until late fall! 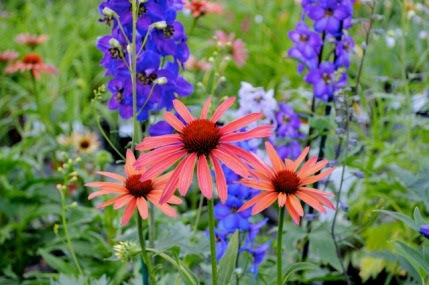 Another theme that seems to be running through our plant deliveries are classic summer flowering perennials and shrubs. 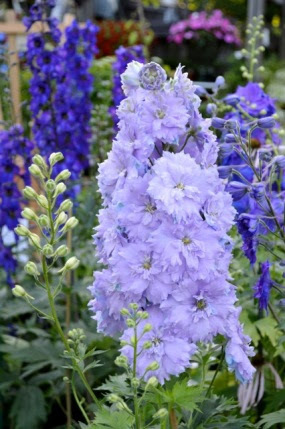 We have ridiculously stunning double delphiniums that will blow your mind. Echinaceas, daylilies, and Heliopsis are all starting to bloom. Summer shrubs such as Vitex (purple and white this year! ), crape myrtles, and butterfly bushes (which happen to be on sale) galore are now in abundance. The hydrangeas we have are insane, including ‘Pistachio’ and ‘Amethyst’. You know something is truly unusual when you hear me squeal out loud with delight at the crack of dawn. This Thursday evening, Kassie Moss is giving a free workshop on edible flowers. This is a lot of fun. Have you ever tried a salad with blue borage blossoms and shredded daylily petals? How about nasturtium blossoms stuffed with guacamole? 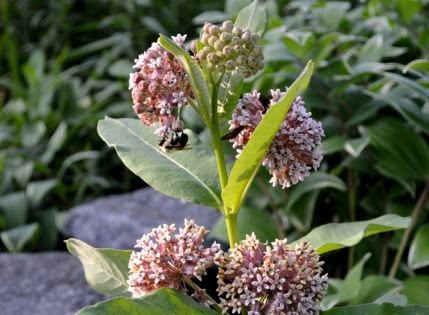 My Saturday morning garden walk will be all about Asclepias- featuring the different kinds of milkweeds and butterfly weeds, the monarch butterfly’s only larval food plant. On Sunday we are offering a Grow Organic Kids event where the kids will plant and take home a fairy garden in a pot. The details on these walks and workshops can be found below in the Calendar of Events box. Milkweed is in full bloom- what a heavenly fragrance. It is visited non-stop by a wide variety of bees and other pollinators. We still have common milkweed plants in stock. This is our last Sunday open for retail until bulb season in the fall. As the weather heats up, our hours shorten until we go into off-peak hours after the Fourth of July. We will be open on July 4th for a shortened day, 8 am-2pm. Since it falls on aSaturday, some of my staff have volunteered to work. Since we will not be open on Sundays in the summer, we have planned an exciting trip forSunday, July 19th– we are going to the Highline in New York City! We have rented a bus and myself and many of my staff members are signed up. We are now opening the trip up to the public. There are only 35 seats available so if you want to join us, register IMMEDIATELY! The details are in the box on the left. Our bi-weekly specials are changing this week and starting Thursday, all delphiniums and Coreopsis will be on sale at 20% off. We have lots and LOTS of butterfly bushes on our benches right now, and they are beginning to bloom. Enjoy the sunshine and the long, delicious summer evenings. Carve out some time for yourself to come by for a visit this week and see how pretty summer can be. It’s magical!